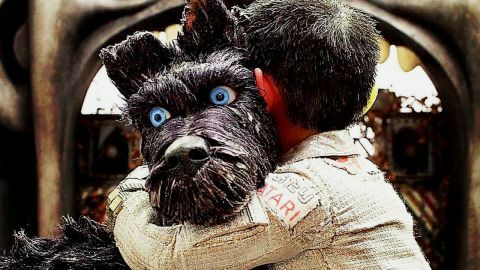 Isle of Dogs review: "A barking mad shaggy dog story with imagination to spare"
A barking mad shaggy dog story with imagination to spare. 13/10, would watch again. I wouldn’t bring puppies into this world,” says a performing pooch in Wes Anderson’s Isle of Dogs, the auteur’s latest fastidious feature. It’s set in a dystopian Japan run by a grotesque demagogue who campaigns on a platform of fear-mongering bigotry. As such, it’s no stretch to see the film’s titular trash island as a reflection of our own garbage world. Asking us to consider, “Who are we, and who do we want to be?” it’s a film with bark and bite; albeit one populated by a loveable collection of animated canines destined for gif immortality. Having honed his stop-motion chops on 2009’s love-or-loathe-it Roald Dahl adap Fantastic Mr. Fox, Dogs ranks among Anderson’s most inventive works to date. Twenty years from now, snout fever has reached epidemic levels on the Japanese archipelago. In response, the fascist authorities, led by Mayor Kobayashi (co-story originator Kunichi Nomura), banish every dog in Megasaki to an exile island covered in the country’s rubbish, starting with “short-haired oceanic speckle-eared sport hound” Spots (Liev Schreiber), the beloved pooch of Kobayashi’s 12-year-old ward Atari (Koyu Rankin). Six months later, the colony of mangy mutts spends its days scrapping over scraps. Chief (Bryan Cranston) is a bitter, disobedient stray who roams the rubbish heap with a pampered pack including Rex (Edward Norton), Boss (Bill Murray), Duke (Jeff Goldblum) and King (Bob Balaban). It’s this collection of canines who stumble across Atari when he commandeers a biplane and crash lands on the smelly isle in search of Spots. “I’m against the little pilot,” says Chief, who’s against pretty much everything. But before long he (reluctantly) accompanies Atari on a quest to find his friend and protector, while Kobayashi dispatches drones and robo-mutts to bring Atari home. At its heart, then, this is a simple story: one of a boy and his dog. But things are rarely simple when Wes Anderson is involved. Studio Ghibli genius Hayao Miyazaki is credited as a major influence – a fact that’s evident in the film’s gentle rhythms. Full of flashbacks, odd tangents and precisely located lulls, Isle Of Dogs is at its finest in these moments of serenity. And while Anderson’s emotionally distant formal precision means it never makes the heart swell in ways Pixar could have done with the same material, there’s a deep understanding of the unique bond between man and beast on display. For one, Anderson’s got the adorably awkward gait of man’s best friend down to such an exacting degree it could only have been made by a dog lover; there’s an astonishing amount of character behind those expressive eyes. Meticulously composed and obsessively detailed, the world itself is just as rich. Anderson finds the beauty in an island of literal rubbish, taking us on a tour through abandoned theme parks and multi-coloured forts constructed from discarded bottles of sake. It’s scuzzy, but visually splendid, and full of top-notch sight gags; the very best being the way dogs disappear into a Looney Tunes whirlwind of hair, claws and teeth whenever they throw down, the feral violence obscured by a cloud of cotton. The setting is no accident: Anderson’s affection for Japanese culture and cinema is evident in every frame. While the mutts all bark in perfect English, the Japanese characters speak in their (unsubtitled) native tongue, with Frances McDormand waiting in the wings to translate key scenes. An opening prologue about a mythical battle between cats and dogs is told through classical woodcuts. Elsewhere, Ukiyo-e art features heavily (pay close attention to the way water swirls); even composer Alexandre Desplat embraces thrumming taiko drums for an atypical score. Only a subplot involving American exchange student Tracy (Greta Gerwig), who rallies her peers to expose a government conspiracy on the mainland, comes up short. The human sequences are rendered with all the charm and humour of the action on the island, with puppets made from a porcelain-like resin to differentiate them from the cuddly Alpaca wool of the dogs, but it feels perfunctory in comparison. And if you don’t get on with Anderson’s Sahara-dry humour, there’s nothing buried among the laconic line deliveries to convert you. Which brings us to that astonishing cast. Aside from Yoko Ono, who voices a scientist called Yoko Ono in a scene that feels too knowing for its own good, every actor disappears into their role. With dozens of pups to meet along the way, the major stars often get little more than a line of dialogue (or in the case of Anjelica Huston’s mute poodle, none at all), but some make a huge impression with the bare minimum of screen time, including Tilda Swinton as an oracle pug who predicts the future by watching TV. Like much of Isle of Dogs, she’ll have you howling with delight.